Alexander Oberlander Potter (1897-1969) was a professor at Waterloo College (now Wilfrid Laurier University) in Waterloo, Ontario. Potter received his BA and MA from Gettysburg College, Pennsylvania, and his PhD from Columbia University. From 1923-1924 Alex Potter was an instructor at Waterloo College School. In 1924 he became the first Dean and Executive Head of the Waterloo College. A long time member of Rotary International, he served as Assistant to the President of Rotary International, Paris, France from 1937-1938. 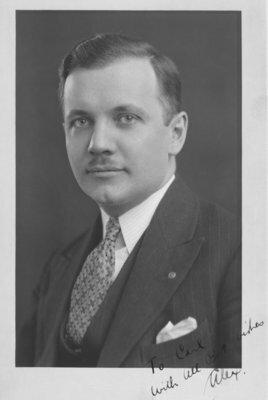 For several years he attended sessions of the League of Nations as a special observer and in 1931 represented Rotary International at the public conference on disarmament in Paris, France. In recognition of his services he was awarded the Order of St. Sava by the Yugoslavian government in 1936. During World War II, Potter worked for the Department of National War Services. After the war he returned to Waterloo College as a history professor, retiring in 1954. In 1965 Alex Potter received an honorary degree from Waterloo Lutheran University.